Fronted by singer Karla Kanora, Rio Mira is an exciting collaboration between artists from Ecuador and Colombia. Their debut album, released on ZZK’s sub-label AYA Records, was produced by Iván Benavides (involved in Latin Grammy-winning groups like ChoqQuibTown and Los Gaiteros de San Jacinto) and Ivis Flies (producer of Latin Grammy-winning social heritage project De Taitas y de Mamas) and is guided by the distinctive percussive tones of the marimba. 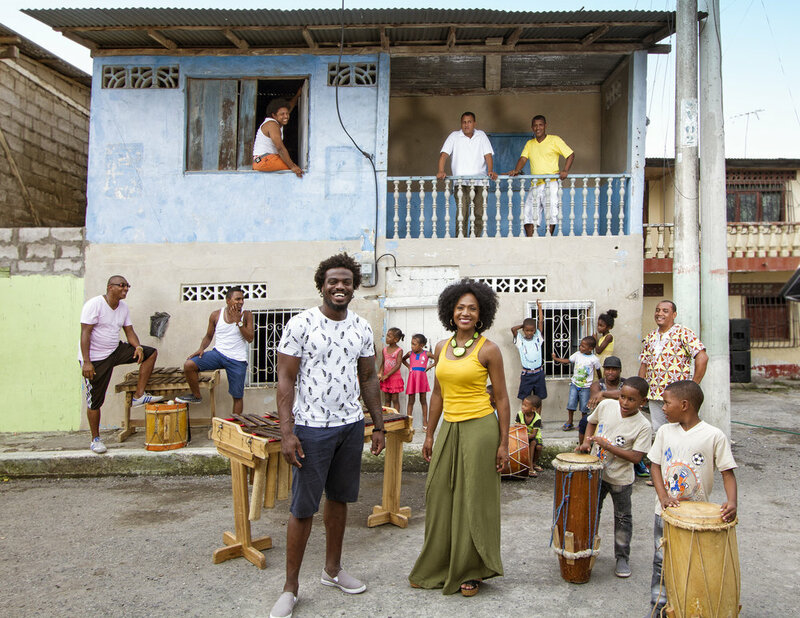 This socially conscious project, based in the coastal town of Esmeraldas in Ecuador and the city of Cali in Colombia, is becoming a symbol of Afro-Pacific identity. The story of marimba is closely intertwined with rebel slaves, known as maroons, who made the region their home from the early 16th century onward. There is a tangible celebratory feeling to this music. Taking its name from the river that runs from Ecuador into Colombia, the band Rio Mira is living proof of the rich history of the northwesterly Pacific coast, their music a reminder of the unity that binds together a region divided by state borders. Rio Mira’s lyrics share stories of traditional value. Driven by the cyclical, interlocking patterns of the marimba, their music combines regular interjections of call-and-response, with rhythm and melody intimately interconnected. Their distinctive sound is dominated by two marimbas – a xylophone-like instrument that has its roots in Africa – matched against drums and shakers, along with impressive call-and-response vocals and harmonies. The result is a set that ranges from Latin dance songs driven by the slinky, rhythmic marimbas, to Aguacerito, an exquisite a cappella piece with a haunting melody based around some impressively high notes. The marimba music of Colombia and Ecuador was declared as Intangible Cultural Heritage by UNESCO in 2015, and this group aims to preserve this cultural treasure.